A fun journey through the mechanism of reasoning and argumentation, illustrated by tons of documented experiments and interesting examples. This MOOC is an introduction in Critical Thinking, with an emphasis on using reason in our daily communication. Its main topics cover the structure and analysis of arguments, the study of inductive reasoning as basis for scientific knowledge and as key ingredient in how we understand reality. Next we will focus on fallacies (like loaded question or hasty generalization) and on guidelines for structuring a presentation, an argumentative essay or a debate. Furthermore, the course gives you an overview of cognitive biases (a fashionable topic nowadays), and on the use of emotional tools in persuasion. The teaching is accompanied by tons of documented experiments and fun examples, guided practice, quizzes, links to additional materials (like TED talks) and short homework. After taking this course you will have the tools to analyze the truth of all kinds of statements, from opinion articles to court verdicts and investment proposals. You will better understand the philosophical basis of human knowledge, also you will be more persuasive in domestic talks as well as in good structured presentations, debates or argumentative essays. Furthermore, a main goal of this course is that you will be able to recognize and refute the most common fallacies (reasoning errors), and understand irrational behavior. No prior knowledge is needed for this course, participants should only come equipped with natural curiosity and a respect for the truth. Chapter 5: Fallacies - tricky arguments that seem right, but are not; how to spot them and call them out using fancy Latin names; 10 fair play rules 5.1: 10 Fair Play Principles in Argumentation 5.2: Fallacies 5.3: Fallacies (again) 5.4: Name That Fallacy! 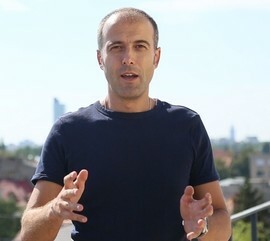 Currently, Radu teaches the pro-course Critical Thinking for Business on iversity. His previous MOOC on Critical Thinking, hosted on the same platform, reached (in 2014 - 2015) tens of thousands of students from all over the world. Radu Atanasiu teaches Critical Thinking for the Executive MBA program at the Maastricht School of Management Romania and for the undergraduate program at the Entrepreneurship Academy in Bucharest, and pursues his PhD at Vrije Universiteit Amsterdam on the topic of managerial heuristics in organizational decision-making. Aside from teaching and learning, Radu conducts Critical Thinking, Decision-Making, and Complex Problem Solving workshops for companies, and is actively involved as angel investor in several promising start-ups. Radu founded DeBunavoie.ro, a non-profit volunteering matching platform, and runs marathons dressed as Mickey Mouse.